Spun Sugar Quilts: I HAD to make a deal. Where should I begin? It was last week. 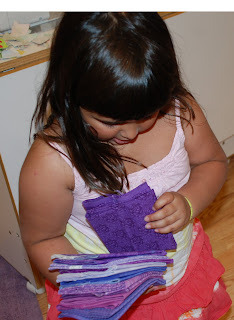 My 4 year old decided that she was going to choose a stack of fabric just for her. I never discourage her from fabric and so I let her go ahead and pick something. Yeah she chose Terrain by Kate Spain. At first I wasn't too threatened. I figured she'd give it up in a few minutes. I noticed the bundle had been undone and all the fat quarters were in her kiddie grocery cart. She was pushing them from room to room. But she didn't really say much about them. I was feeling pretty good and thought I would cut out a few quilt blocks for a new pattern I am testing. I wanted to use the blue/green/purple colorway of Terrain. I nonchalantly took the 15 fat quarters I wanted from her stack. Whoa...that caught her attention and quick. I used my suave parenting skills and told her I would make her a deal. She could take ANY fabric from purple stash that she wanted as a trade. She ended up with 11 or 12 fat quarters. She was very serious about her choices and made sure the orange and pinks in Terrain would match. I kind of felt guilty for taking her, I mean my fabric! That quickly passed after I made my first test block. It goes without saying that this ONE has a 99% chance of being an artist, crafter, quilter. Ha! She's got great taste! =) So precious! Whew! Good recovery! I get a little attached to my fabric so each of my kids has their own stash. If we all like something, everyone get their own piece! Gosh I really need to learn how to share! Your a great example. A girl after my own heart, love this little story! Cute! She def has good taste if she picked Terrain! Love that line! Love the last pic! You're a good Mama, Vickie! What a sweet story! Its going to be so much fun when she gets a little older. What fun it will be to have a quilting partner! That's just too funny!! I don't know if I could share!! Adorable!! Great to see a quilter in the making! She is absolutely ADORABLE!! How could you NOT share? Can't wait to see what she makes from all her fabric choices! The girl's got great taste, you gotta give her that! So cute. What a great story--and your darling child has really great taste! I know I about drool all over every time I see a photo of Terrain online. Can't wait to actually have it in my greedy little hands! How precious! A sense of style at 4! I used to take my granddaughter to the quilt shop when I visited her and let her pick out a couple of fat quarters for her "stash". She had definite ideas about what she liked. How cute! I believe you have a junior quilter!~ better watch your stash! ;-) Have a happy day! Oh my she sure has good taste. She is "sew" sweet! Can't wait until she starts sewing! She is so cute....and loves fabric too!!!! !